One of the hottest gadgets over the past month has been Microsoft's Kinect, a controller-free gaming interface for the company's Xbox 360 gaming system that senses users' body movements and voice commands for interacting with gaming and entertainment content. As noted by InformationWeek, Apple has expressed interest in using somewhat similar technologies, as well as its own multi-touch gesture control, for interacting with such devices as kitchen appliances and vehicles. The revelation comes from a patent assignment in which inventor Timothy Pryor transferred his interest in three patents and ten pending patent applications to Apple, an assignment that was made in March of this year. The various patents and patent applications have to do with the control of machines, specifically through a combination of touch screens and video sensing. They include titles like "Man Machine Interfaces For Entering Data Into A Computer" and "Programmable Tactile Touch Screen Displays And Man-Machine Interfaces For Improved Vehicle Instrumentation And Telematics." While the oldest of the patents included in the transfer was filed over fifteen years, ago, the ten patent applications have all been filed since August 2007. 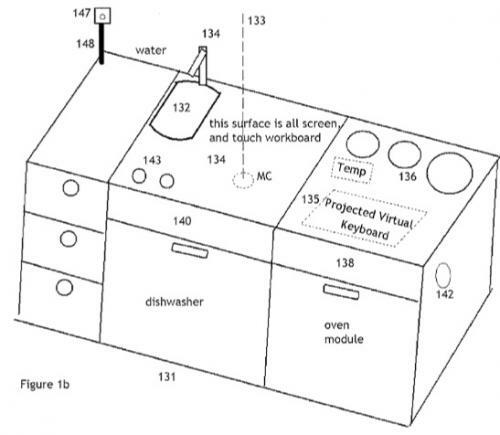 One patent application in particular, entitled "Control of Appliances, Kitchen and Home", describes how a rear-projection display and sensing array could be used on a kitchen countertop or directly on appliances or other surfaces to detect the user's motions and assist with food preparation while also providing access to other home automation and Internet-related functionality directly from the countertop. "Machine vision sensing, coupled with suitable computer software, can also, as disclosed in my referenced applications, determine gesture commands in space made by a person, and can determine various features of the person or objects they are working with, or in some cases their movements and action," the patent application says. 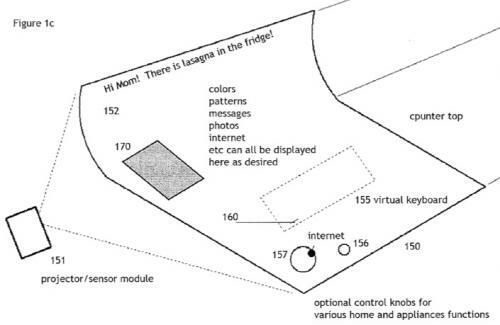 Pryor's patent application proposes touch-enabled appliance surfaces that can control a multitude of appliances and "can ease kitchen and house work, while allowing the user to share time for home functions with Internet shopping, social networking and the like." Obviously, it is unclear exactly what, if anything, Apple plans to do with the intellectual property it acquired from Pryor. It seems possible that Apple may simply have been moving to lock in ownership of some aspects of the inventions that relate in some way to the company's vision of implementations for multi-touch functionality in general, but clearly Apple has a significant interest in Pryor's work given its acquisition of a significant number of patents and patent applications.